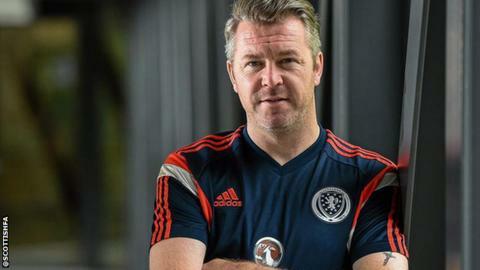 Bristol Academy have appointed former Hibernian Ladies manager Willie Kirk as their new head coach. Kirk, who takes over from Dave Edmondson at the Women's Super League One club, has worked as women's high performance manager at the Scottish Football Association since July 2014. The Vixens sit bottom of the top flight without a point from four league games. Chairman Simon Arnold, who said Bristol lacked team spirit under Edmondson, described Kirk as a "motivator". Kirk, who Arnold likens to England Women's head coach and former Bristol boss Mark Sampson, spent almost five years at Hibs and won the Scottish women's football manager of the year award in 2013. Kirk will be in the stands for Bristol's next match at Birmingham City - the only other side in the top flight without a win this season - and will take charge of his first match at home against Arsenal on 9 May. Arnold told BBC Sport: "Everyone knows that Bristol Academy doesn't have the budget of the other clubs. What we have got is amazing training facilities, a great fan base - we have a lot going for us. "We need someone who can look at our positives and work with those. We are not going to get the best, most technical players in the country, we haven't got the budget for that, but we have a club where we get the fans behind us, get the atmosphere going and where people want to play for the club." Kirk said he is "delighted" to get the job, having missed out when Edmondson was appointed last year. "I believe I can build on the foundations laid by Dave Edmondson and Bristol have enough money available for me during the next transfer window to strengthen the squad," Kirk told the club website. "The girls here have big hearts, they want to play for each other and the spirit in the camp is very positive which is a great place to start."